Oui, je vois le pug. At a distance, the pug could pass for a Siamese cat, a garden tchotchke, or a friendly gargoyle. That's quite a deck! Karen, well, except for the cat it is all those things. 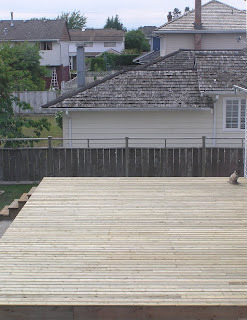 That's my neighbour's deck, freshly rebuilt after having collapsed beneath last winter's snow.